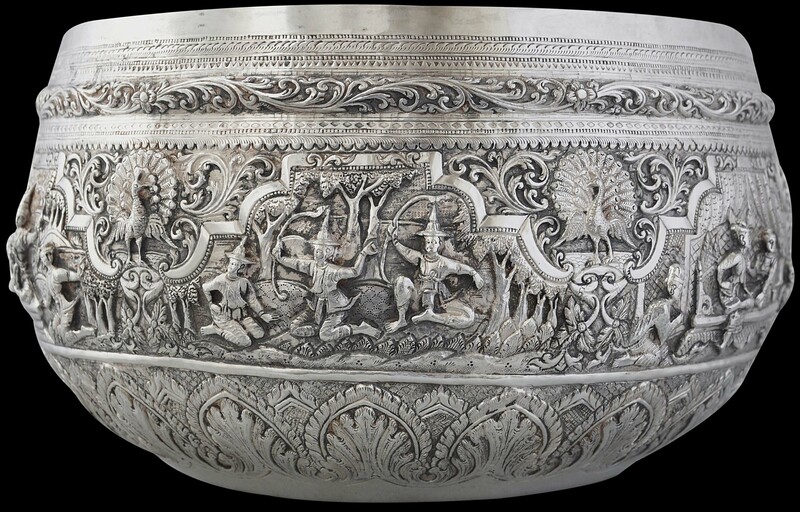 This large silver bowl is repoussed with various Burmese courtly scenes, all between a wide, leafy lower border, and an upper border that comprises a scrolling orchid design known as the dha-zin-gwei motif. There are six discrete panels which show scenes of the king, the chief queen, princes, cabinet ministers (they have tall rounded hats) and other figures. The scenes are separated by scrolling, entwined flowers and foliage and male peacocks with tail feather fully arrayed. 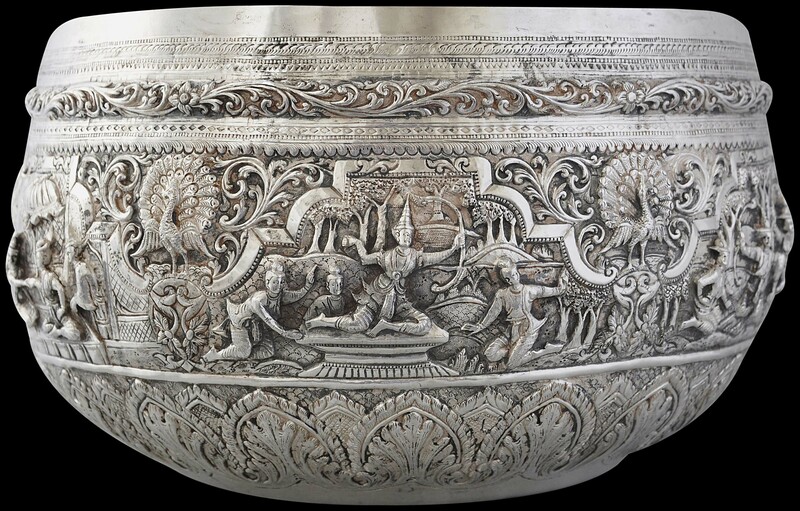 Such a peacock motif was the emblem of the king in Mandalay and so is in keeping with the royal theme of this bowl. 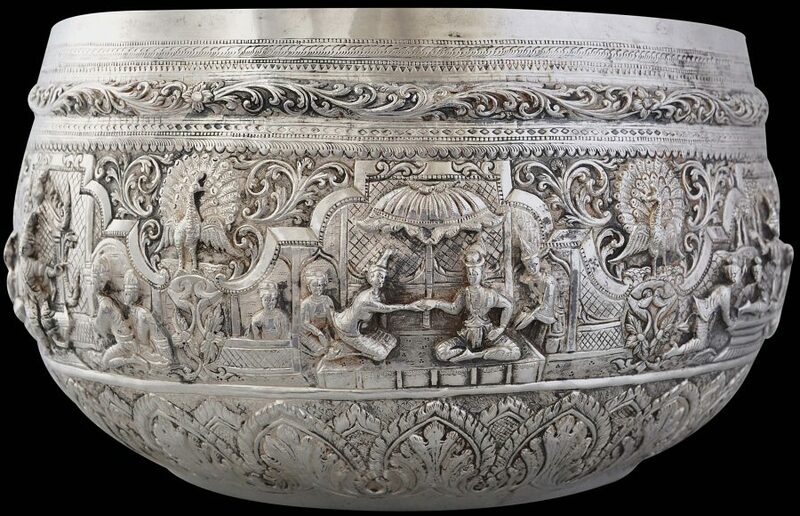 The base is engraved with another peacock within a roundel. The king seated on the Lion Throne and addressing to cabinet ministers comprises one of the six scenes. 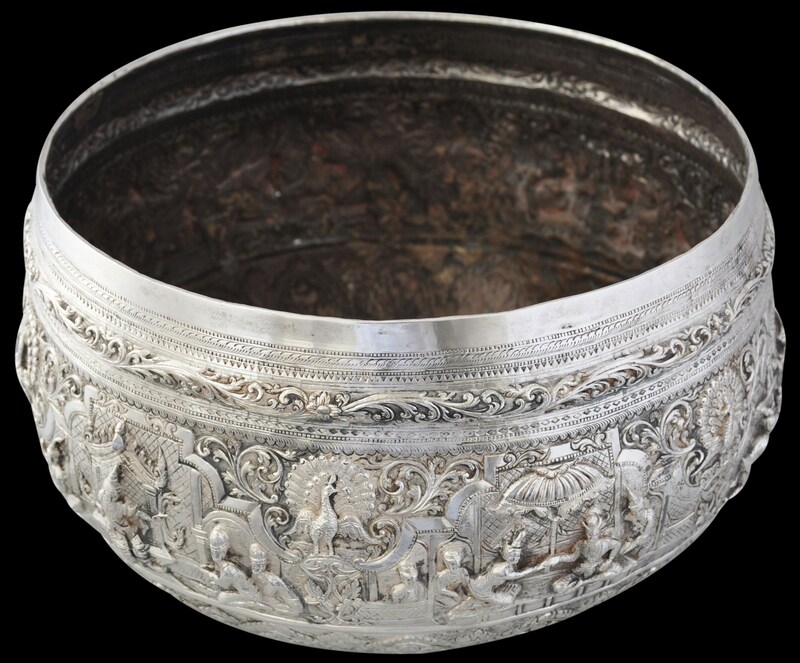 In actual fact, none Lion Thrones existed in the Mandalay Palace – nine being a deeply auspicious number among Burmese then as now. 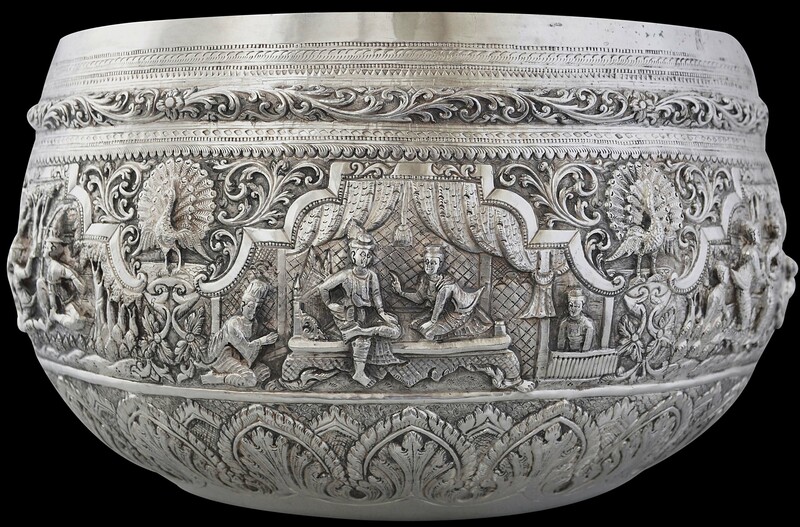 The thrones were carved simultaneously on Friday, the 11th Waning Moon Month of Kason, BE 1220 (sometime in May of 1858). Only one of the original nine thrones survives. Only the King and the Chief Queen could sit on the throne. They climbed up to the throne by a short flight of seven steps behind the throne and through a door at the back. The stairs were screened off with walls on either side. 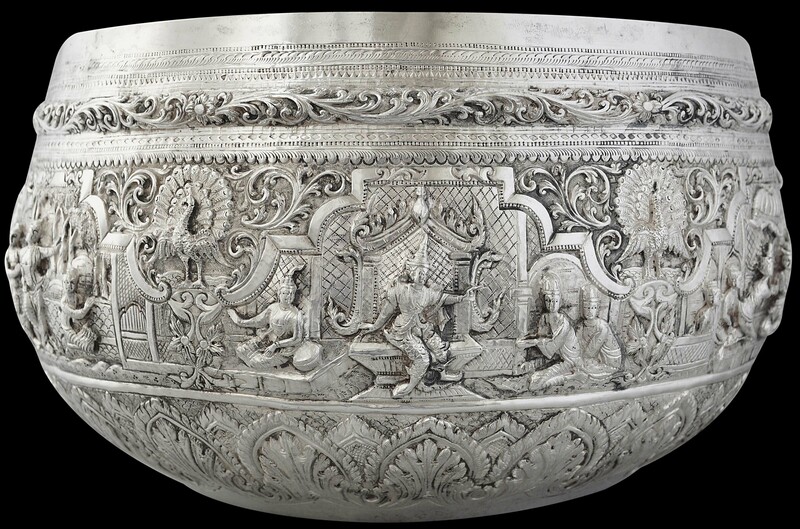 The shape of such bowls is based on the monk’s begging bowl, although ironically, Burmese monks are prohibited from touching gold or silver. 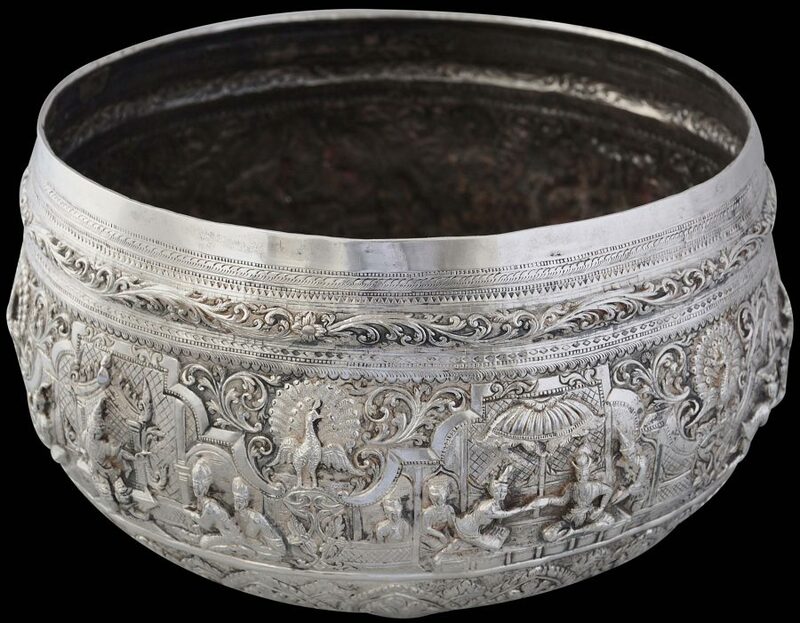 Accordingly, Burmese silversmiths did not use their skills to produce religious objects, unlike silversmiths in other Buddhist lands such as Tibet or Sri Lanka, and instead were employed producing items for the colonial market and also for wealthy local Burmese. Overall, this is an impressively large bowl. There are no repairs, dents or splits. The walls are relatively thick. The silver has not been over-cleaned – there are remnants of tarnish here and there. 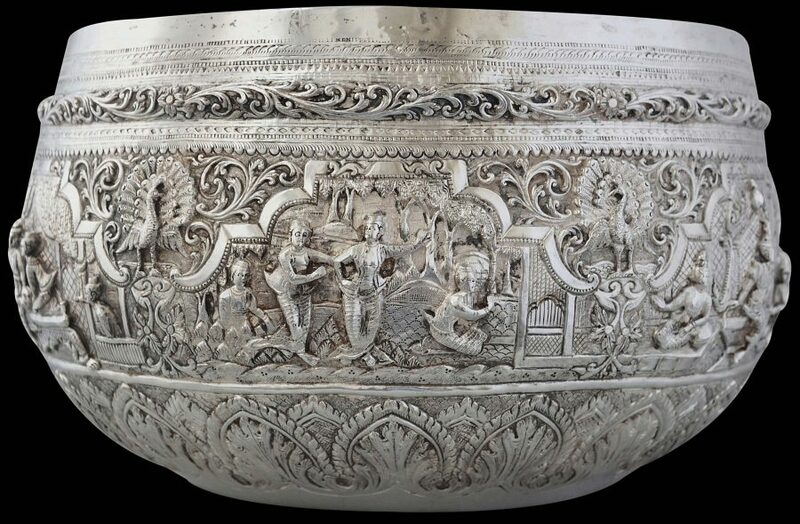 The bowl was sourced from within the UK and almost certainly it has been in the UK since the colonial era – it came to us in a very tarnished state. It is more impressive perhaps than the photographs allow. 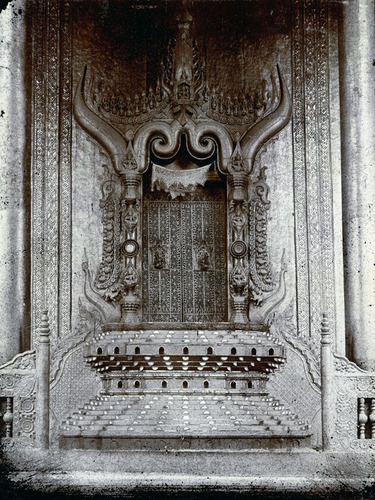 The Lion Throne on the bowl, and an actual throne from the Mandalay Palace. Fraser-Lu, S.,Burmese Crafts: Past and Present, Oxford University Press, 1994. 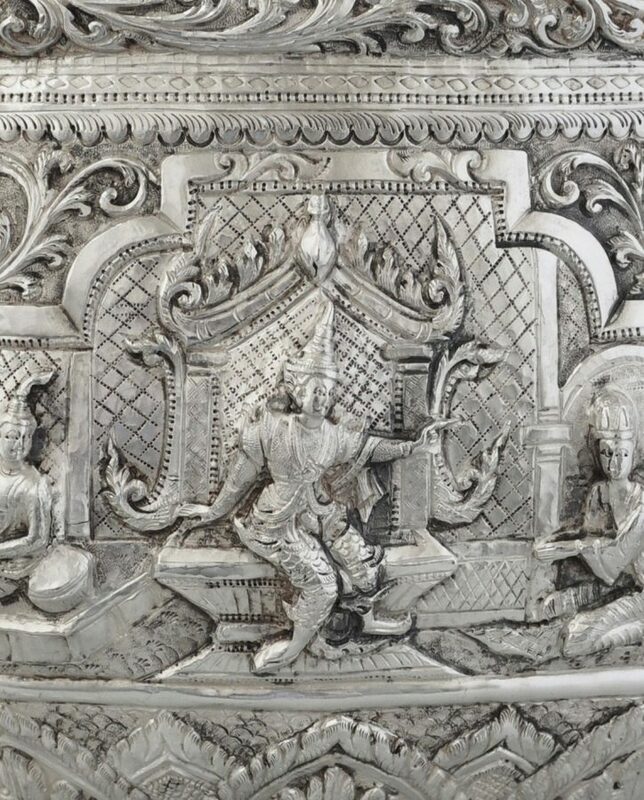 Tilly, H.L.,The Silverwork of Burma (with Photographs by P. Klier), The Superintendent, Government Printing, 1902. 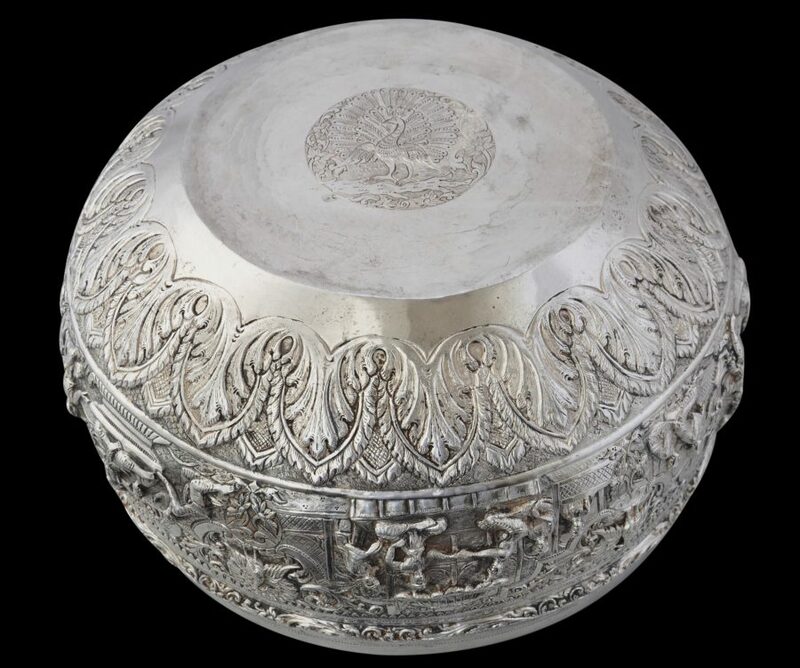 Tilly, H.L.,Modern Burmese Silverwork (with Photographs by P. Klier), The Superintendent, Government Printing, 1904.